Screen printed on polyester, this outdoor fabric will withstand up to 500 hours of sunlight exposure, resists stains, is water resistant and has 10,000 double rubs. Perfect fabric for porches, patios, deck side, pool side and boat side create toss pillows, cushions, upholstery and great for tabletop, tote bags and more. To maintain the life of the fabric bring indoors when not in use. This fabric can easily be cleaned by wiping down or hand washing with warm water and a mild soap solution, simply rinse with clear water to prevent dirt from embedding itself into the fabric. 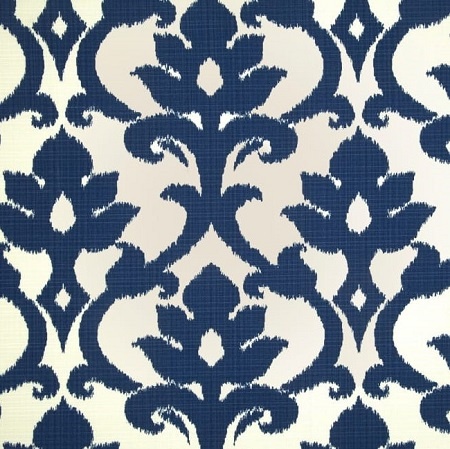 Colors include navy blue on an ivory background.